After working in web development for many years its rare that you get to work with a technology that changes how you program a web app. I recently had the opportunity to work with one such web technology generally known as Comet. While it has been around for several years, its become more common as the demand for real time data and responsive applications has increased. 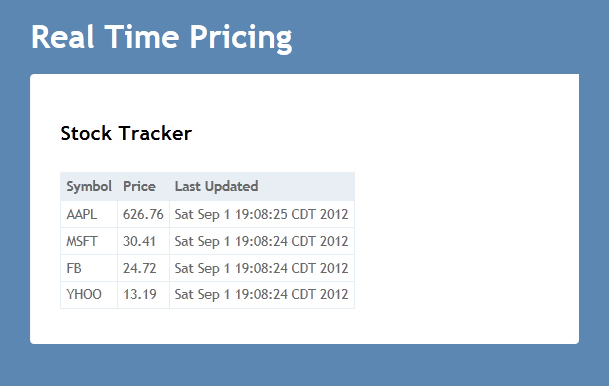 I’ll walk through creating a real time stock price tracker using SignalR, knockoutjs, and underscore to show how easy it is to feed real time data to a client browser without the typical heavy-handed async updates and DOM manipulation of most applications. For our simple example the client will only be listening for messages, and not sending them to the server. So we only need an empty class that inherits from Hub to send updates to the client. We’ll create a separate thread to send price updates to the client via the Hub. I hope this example demonstrate the simplicity of working with real time data with a few open source libraries. The source code of this post is available for download here. I than reformatted the regular expression so that non-decimal characters would be removed without destroying the original value, but this will also remove the cents. I’m going to give it another try later so the cents will stay in tact.